YakGear Brand Ambassador Bill Pulkovski grew up in Detroit, Michigan. Some of his earliest angling memories include fishing with his dad in urban settings along the Detroit River, a massive waterway that connects the Great Lakes and separates the United States from Canada. He enjoys fishing throughout the country, but counts himself lucky for the angling opportunities available in his home state. With four great lakes, 11,000 inland lakes and more than 36,000 miles of streams, Michigan’s 3,288-mile shoreline is longer than any other state, except Alaska. A lover of the great outdoors, BIll truly likes “playing outside.” He enjoys camping, bushcraft, fishing and boating. His multi-species angling interests range from wade fishing for steelhead trout to ice fishing for pan fish. That being said, his true passion lies in kayak fishing. 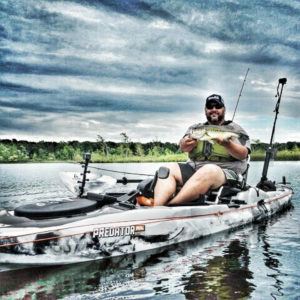 Bill believes fishing from a kayak is most therapeutic, as it allows the fisherman to be one with the water and reflect. It heightens one’s senses, allowing them to see more, hear the surroundings and feel the water through the boat. In contrast, Bill also enjoys the excitement and competition kayak fishing tournaments provide. Managing the gear and boat, all while wrestling a big bass, really gets the heart pumping. When Bill isn’t on the water, you can find him editing video footage for his YouTube channel, spending time with his family and working. His “day job” consists of work as a freelance illustrator, designer and college professor. Bill has worked in the entertainment industry for the past nine years, providing artwork for properties such as Star Wars, The Walking Dead and Marvel Comics. He teaches media communication courses at Macomb College. Bill currently resides in a Detroit suburb with his wife, Sara, and three wonderful girls.